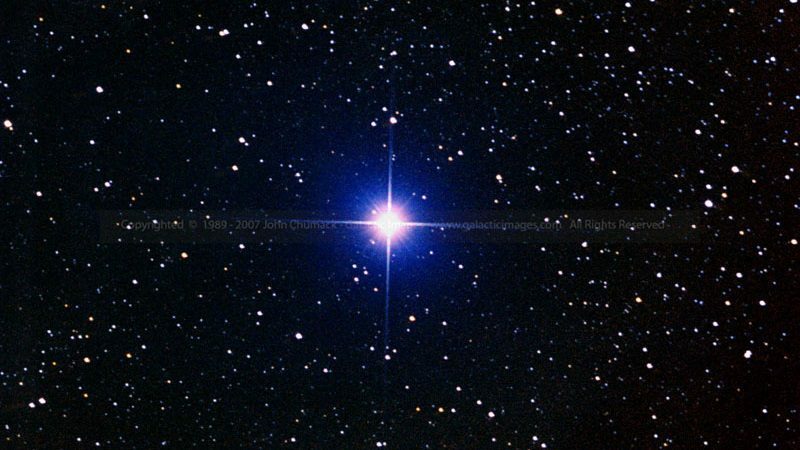 Fixed star Deneb Adige, Alpha Cygni, is a blue-white super-giant star in the Tail of the Swan, Cygnus Constellation. The most common name for this star is Deneb, which comes from the Arabic Dhanab, meaning Tail. There are various other named fixed stars which indicate the Tail of something, for example Deneb Kaitos, the Tail of the Whale. 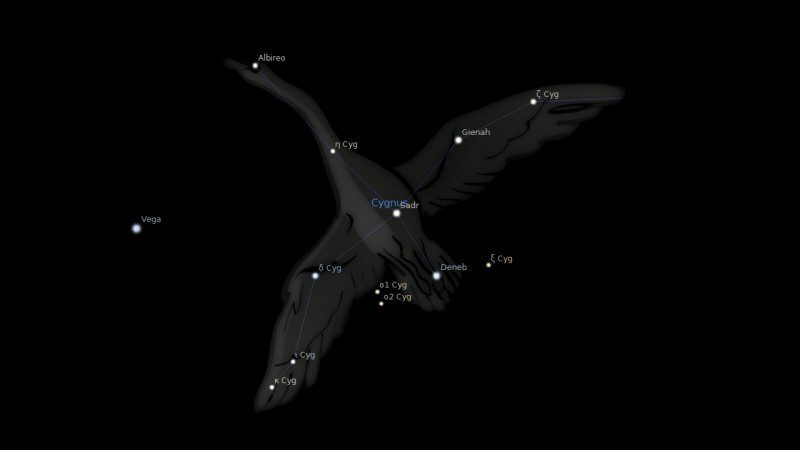 Thus for differentiation, astrologers term the brightest star in the Swan Deneb Adige, with Adige coming from the Arabic for Hen, Dajajah. Deneb Adige is the 19th brightest star and it makes up part of an asterism called the Summer Triangle, shown in an image below. The Summer triangle is a large asterism visible in the northern hemisphere is summer. Besides Deneb Adige, the other two fixed stars are Vega and Aquila. Deneb Adige is a Venus and Mercury type star which gives an ingenious nature and a clever intellect that is quick at learning. Favorable for artistic and scientific pursuits which are carried out with the aim of gain. 1. Fixed Stars and Constellations in Astrology, Vivian E. Robson, 1923, p.42, 159. 2. Fixed Stars and Their Interpretation, Elsbeth Ebertin, 1928, p.76. 3. The Fixed Star Health and Behavior Imbalance, Ted George and Barbara Parker, 1985, p.161. 4. Fixed Stars and Judicial Astrology, George Noonan, 1990, p.12. Jaimie, what about having this star conjunct your Mid-heaven? Within less than one degree? 0.56′? Try to apply the general descriptions to your career. With the spiritual things, your MC may apply more to a calling rather than career. A good influence either way because of the Venus Mercury nature. Last years fall equinox at night was powerful… I saw the Summer Triangle light up and seem to communicate with each other like lasers…. My mind was blown and I had to research… Wow! My north node is 7° pisces as well and cancer moon 1° cancer rising 3°. Jupiter would also be in a spiritual part of the sky in Virgo constellation. Syrma and Khambalia. Jamie, I have it at the mid-point Jupiter/node north and mid-point Jupiter/Lilith, at the nineth house – can you tell me the meaning? Thank you. Basically all fixed star astrologers only recognize conjunctions, not even oppositions let alone midpoints. I have Juptiter at 6 degrees Pisces, 7th house, a conjunction, yes? Any remarks? Read “All Other Planets” and then it would be the best scenario. I have Mercury and Ceres within orb conjunction this star. I agree with the comments on spirit guides and spiritual endeavors/occult interests. I’ve found this to be an interesting placement for my Mercury since traditional astrology defines Mercury to be “debilitated” in Pisces. I will admit there is a strong tendency towards more of an abstract mental process that could be considered “insane” due to the mutable and dreamy qualities of Pisces, especially with slight influence of unconventional Aquarius at this degree. However, it does allow me to think outside the box and is of benefit as long as I keep my mind on more of a “spiritual path”. I could very easily see this as a poor placement for Mercury if there are difficult aspects, especially to Neptune and Uranus. Great feedback Michelle. New research in archeoastronomy has found many of the burial chambers in the UK aligned just off North to this star. Seems the mythology related to the fact that this star never quite sets, but dips down and the rises again through the year to pick up souls. Oh wow! That is very interesting! Do you have a link to some of this research? No, sorry Michelle. I heard it at the yearly UK astrology conference in London a few years ago. In a talk by a student from the MA Cultural Astronomy and Astrology. I think Bernadette Brady helped in discovering it. My Mum’s got this star conjunct her moon. She’s very switched on and also psychic. She also has moon trine Neptune. Good aspect to fixed star conjunction will enhance the good quality of the star, and can negate the difficult ones. Just as challenging aspect can reduce the good fortune of a particular star. In both cases I think the influence of the star would grow. Yes, that’s interesting. I’ll remember that. I mistakenly commented on the wrong star earlier. I’ve had a lot of my mind and was staring at the small screen on my phone – as compared to looking on my laptop. There’s so much evidence with these fixed stars though. Yes I deleted the other on eon Algenib. As I find more information I will add it to these pages. My current project is to add celebrities for each planet conjunct star contact. Slow going! I was going to suggest to delete it, as I’d made the mistake. That’ll be interesting – good luck. Slowly, but surely. I have Deneb conjunct my Ceres and Jupiter (Retrograde) in my 1st house in my natal chart. I am very intuitive and a lot comes to me through dreams. Have you seen any significance of Deneb on the astroids? Thanks for the feedback Helene. No, I have not done any research on asteroid with fixed stars. Ceres is actually a minor planet now, the same classification as Pluto. Perhaps I should start taking note of her as I add celebrity planets to these fixed star pages. I have Deneb conjunct my North Node. What could be the meaning of that? I have the same aspect, conjunct my north node. I think it may be that we need to listen to our intuition in order to get help from our spirit guides to move us towards our north node goals. Anyone else have any thoughts on this?